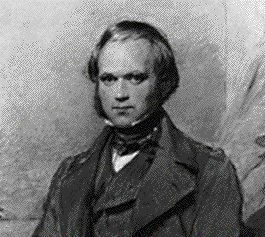 The history of evolutionary biology really begins in 1859, with the publication of Charles Darwin's On the Origin of Species; but many of Darwin's ideas have an older pedigree. The most immediately controversial claim in Darwin's theory is that species have not been permanently fixed in form, but one species has evolved into another. ('Fixed' here means unchanging.) Human ancestry, for instance, passes through a continuous series of forms leading back to a unicellular stage. • Charles Darwin's grandfather Erasmus Darwin. However, none of these thinkers put forward anything we should now recognize as a satisfactory theory to explain why species change. They were mainly interested in the factual possibility that one species might change into another. The philosopher of biology, Helena Cronin, describes the importance of Darwin's theory.